The Alexandra Arms was my favourite pub in Kettering and also my favourite in the county of Northamptonshire on a Sunday afternoon visit. This comes fairly close to ticking most of the boxes I'm looking for in a town pub. There is a front bar, which is fairly cosy and another room at the rear where Northamptonshire skittles was being played. Ales are different in each bar. This is a Marston's pub. So there was Wychwood Hobgoblin Gold, Marston's Pedigree New World & Banks's Bitter. But in addition, there was Church End Folka Cola, Hopback Summer Lightning, Castle Rock Screech Owl & Nobby's Swift Nick on. Ciders were Farmer Jim's Rhubarb Bob & Mango Cider & Lilley's Rum Cider. A number of handpulls were unclipped. So the range can obviously get better. The array of pumpclips on the walls is certainly impressive. Locals seemed friendly. My only slight negative was a perceived frosty reception from the barman. But otherwise, definitely recommended. Still the best selection of ales in Kettering though no longer in the GBG for some reason - maybe a dispute with the local camra people? By far the busiest of pubs visited in Kettering on Saturday night which must say something. Excellent boozer, friendly guv behind bar. Handled a group of us on Saturday afternoon brilliantly with no warning. 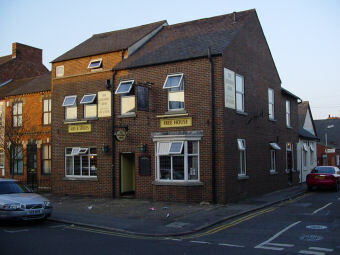 Next time in Kettering this is the only pub to visit. Cracking pub with a fantastic range of ales. Friendly barman. An Absolute Cracker. Pub as a pub Should be. Thirteen real ales on, Yep thirteen. one brewed in the cellar no less. Lived in Ketteringshire for nearly 3 years now and this is the best pub i have come across by far. wish i had found it sooner. Will be comin back as much as she allows. Yee Ha!